Say hello to Bonzi, and yes he is as fun of a dog as his name might imply. Bonzi is a young guy, in his very early years, and he was dealing with some serious struggles. He was limping on his back leg, was losing energy, and was having pretty chronic ear infections as well. Bonzi is a really active dude, so it stands to reason that he has probably thrown himself out of whack a time or two, which is exactly why his parents wanted to try out animal chiropractic! 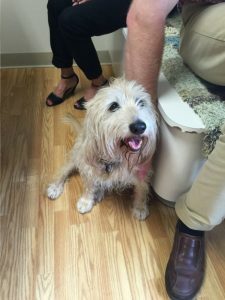 Bonzi came in with significant muscle loss in his back right leg. Turns out he had been favoring it much longer than he had exhibited symptoms, as the muscle tone was so different between his left and right side. In addition, this guy despite him being a larger breed dog, had luxating patella in this same hind leg. It was both good news and bad, because it explained his lameness, however luxating patella in a large breed dog can be a little more troublesome to manage! On top of all his hind end issues, Bonzi had been a long time sufferer of ear infections. They didn’t happen constantly, but they did happen consistently. After giving him a good once over, he certainly needed some work! Bonzi has been seen a handful of times now. 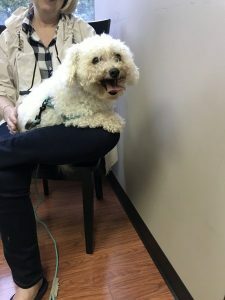 During this time, his luxating patella has improved in the frequency with which it pops out thanks to chiropractic and his parents doing diligent at home exercises, his ear infections happen less often and when one shows up they know its time to get adjusted, and his muscle tone in both of his hind legs are equal as he no longer limps. 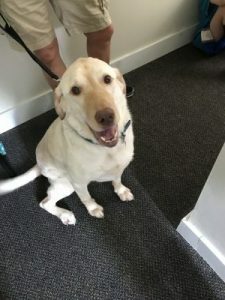 Bonzi is a wonderful pup that gets to really enjoy his life again thanks to his parent’s interest in alternative therapy. We love this guy!